By extending the capabilities of Microsoft SharePoint—an industry-leading solution for simple, file-based collaboration—to enable the sharing of CAD and other structured data among teams, Windchill ProductPoint greatly enhances product development processes. In essence, Windchill ProductPoint exemplifies social product development: Namely, the convergence of Microsoft's social computing initiative—the utilization of social networking technologies and associated Web 2.0 services for business-related purposes—and product development activities. The result? A heightened degree of collaboration, productivity and effectiveness in the use and leveraging of CAD data across organisations. Employing Microsoft SharePoint as a foundation, Windchill ProductPoint offers vaulting, sharing, visualizing and mark-up capabilities for product data through its support for multiple CAD authoring applications—a powerful functionality that yields significant benefits. In addition, the synergy between Windchill ProductPoint and Pro/ENGINEER Wildfire 5.0 renders possible the Web 2.0 two-way/community-structured communication benefits that are inherent in social product development, via tools such as toaster pop-up notifications, presence detection, model notes wikis and collaboration spaces. Social product development capabilities, whereby social computing and associated Web 2.0 technologies are extended to the product development arena. Enhanced CAD data sharing, CAD vaulting, CAD file management and work group collaboration through multi-CAD support, including support for Pro/ENGINEER Wildfire 5.0, AutoCAD and Mathcad. 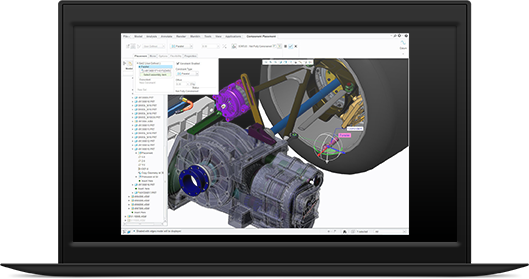 Management and versioning of CAD data offers advantages over network drive-based storage systems and FTP sites, thus enabling effective concurrent engineering. Inherits the easy and fast deployment characteristics of SharePoint.